What a year! Duolingo for School’s first anniversary is coming up, and we have a surprise for you! Get ready for an exciting end of year break and an even better 2016… you asked for it, and we are currently testing the new design of Duolingo for Schools that includes Assignments. With Assignments, teachers who use Duolingo for Schools will be able to ask students to reach a specific goal by a certain date. Educators can choose if they prefer assigning an XP goal (for example, reach 100 XP by Friday) or a skill goal (reach the skill “Food” by next Tuesday). Teachers can set this up easily in their Duolingo for Schools dashboard. All students will receive an email notification explaining what they have to do and by when. If this is a skill assignment, the email will also include the skills they have to unlock to reach the assigned skill. This is a feature we are currently testing. That means that some of you won’t be able to see it yet. For those of you who are in the testing pool, please let us know what you think. 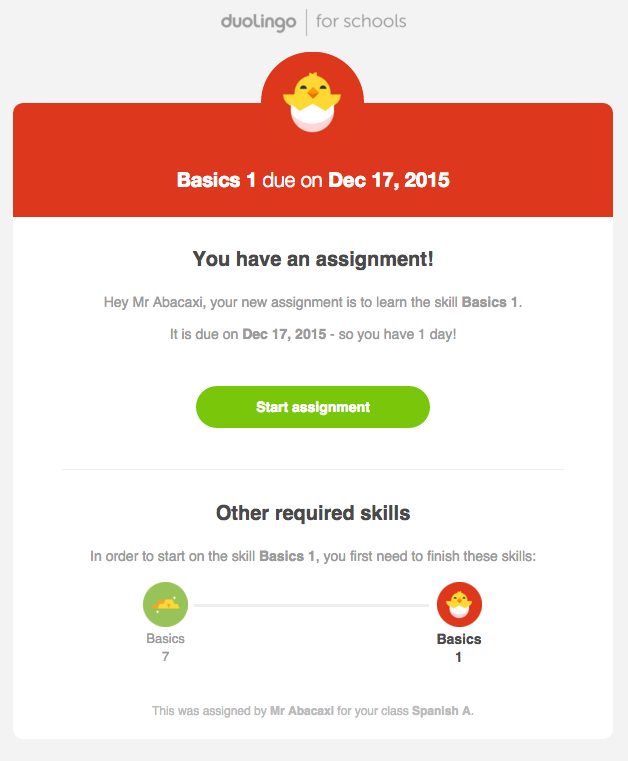 We plan to keep improving this and add even more exciting features to Duolingo for Schools in 2016! We have worked hard to make this available to as many of you as possible right before the end of year break. We know some of you would like to encourage students to keep those skills up while they’re on break. How about a special reward for those who successfully complete the challenge? No more backtracking, let’s keep the practice up, come back ready to pick up where we left off, using everyone’s time more productively. Tell us how you encouraged your students to keep up their language skills over their break. Happy teaching (and happy resting)! For those of you missing the previous views, they are still available! In your classroom, just go to "Students" (left menu) and select "More Details". You can see many skills the student has completed. Update: The "dot" course progress is back thanks to your feedback! Follow the instructions above and select "Course Progress" ^. Update 2: Assignments are due midnight between the day before it's due and the due date. This means that if something is due Friday, students need to complete it by Thursday night (before midnight). This system may change as we explore more suitable ways to assign due dates around the world, so please keep an eye on the forums—we'll let you know when that happens. Hi everyone, thank you for your feedback! This change should go out in the next couple of hours! I will post again when the Course Progress view is live. Thank you for your patience and your feedback, please keep it coming! The Course Progress is now back. Please check updated instructions in the main post! Thank you for adding back the "dots". Incredible that you responded to our feedback so quickly! I am excited about the assignments! Is there a place on a student account where THEY can see the status of assignments? So far all I can find is an email notification. THANK YOU! THANK YOU! THANK YOU! I'm absolutely thrilled that my students now have an assignments dashboard on their accounts! Now, they can see which assignments are due, and how long they have until they miss the deadline! This just made my day when we went to the lab this morning! THANKS SO MUCH for listening to us so that we can continue to use this tool effectively in our language classrooms! So far, unfortunately, it seems that this isn't possible. As a teacher, I'm REALLY hoping that this is one of the next improvements DL makes! Hopefully, since they've got something already like that set up for us (teachers), it won't be long until a student can view his or her own assignment status, as well. I totally agree. If I give an assignment, the students don't know how far they are towards completing it. I have to look up everyone's progress and tell them individually how many more XP they need. The only way around it is if I give an assignment for 1 week starting on Monday due "Saturday" That will tel them with a line graph how many XP they earned that week. They have to look at Mon, Tues etc. and see how many XP they earned each day and add up their daily totals. It doesn't work for more than 1 week at a time. Sra Sims: try assigning only 1 week at a time, they can see only that much. Please bring the Progess Detail back! It was a great VISUAL way of looking at the class as a whole. The DOTS provided a visual for the students on what to complete. The course progress now is not as good. I agree! I used to show my class visually how much progress they had to make and now I can't find it!!! How about having some form of communication between the teacher and student other than in the classroom. Something like a message board or a chat feature where one could reach out to the student, comment on their progress and be available for feedback. I would like to have my account reset back to the way it was. I cannot see my entire class' progress at a glance with the icons at the top of the screen. This is very upsetting. Please reset mine so that I can grade my student's work. I do not have the time to click on each student and see what they did that week. I have over 140 students daily and i need to see them as a class to record their progress into my gradebook. HELP!!! Why not warn teachers ahead of time about changes? Thank you for restoring the feature. I agree change mine back please! SAME!!! I was going to grade today and now it's going to take a long time!!!!! Yes, I have a class website where it'll be posted, and they'll be assigned it in class as well. No big deal -- I just like have LOTS of ways to keep them from saying they "didn't know." Thanks again! I'm hoping for this feature as well. I teach ESL and am using Duolingo as an in-class practice activity. It would be much easier if my students could see the assignments on their own accounts so they know which lessons need to be completed without having to check email. Hi, the assignments feature is a very good addition ! However, I would like to have the ability to choose the activity -- at least within a level -- . I understand the progress has been "scientifically tested" , but I humbly suggest that there are interchangeable activities of similar complexity and that the specific order can be considered arbitrary. Anyone.... ? Hello! Can you please explain what you mean by "within a level"? You cannot choose to skip the order, not only because it has been scientifically tested, but because each lesson is built on the previous lessons. Changing that is not easy on our end... for now, if you believe your students have what it takes to skip lessons, you can encourage them to "test out" of skills and sections they already know. I hope this helps! It would be nice if the assignment only counts as "completed" if the skill has been gold once during the assignment period. This is for students who had finished the skill before. I get around this by assigning a number of points to get to as well as a chapter. If the chapter's new, then finishing it will also finish the points. If the chapter's already been done, then they can do review work to get the points. Please don't misinterpret my intent with this post. I greatly enjoy working with DuoLingo and it's shown nothing but gains for my students...when they can actually access their assignments that is. Unless I missed an update somewhere, students can only access their assignments in their email accounts. There's too many variables to that equation: reliable wireless signal, pop up blockers, internet signal at home to begin with, lack of email, forgetting emails, junk/spam folders that AUTOMATICALLY delete their contents after a certain amount of time. Why are the assignments set up this way? Wouldn't it be easier to post the assignments to the class page like many other educational websites already do? That way students access their work in the website and upload the results in that same website. I understand that they can work on DuoLingo without activating their assignment but it just makes things that much more convoluted later when they need to be accountable for their work or lack thereof. This looks fantastic! Thank you, Duolingo, for the constant improvements to Duolingo for Schools! I like the new feature but can I 1) get the page that showed everyone's experience gained at that moment. We have to individually click to see how much into the assignment the student is. Also can we 2) DISABLE some aspects of the tree that can be abused for additional points like bubbles called basics. I get around this by assigning "Gold Checks" where the students have to show me their tree in full gold. Question about the due date: I was expecting students to have the opportunity to finish the assigned lesson on the day it is due, however it appears that if it is not completed before the day it is due it is marked as "missed". Is this intended behaviour? Also it appears that the students cannot unsubscribe from email notifications about due dates and assignments - they continue to receive them after they have clicked the unsubscribe link. Hi there! Right now, the due date is interpreted as the very beginning of the day an assignment is due. We will likely revisit this in the next couple of weeks to take feedback from our educators community into account. Would you prefer due dates to be midnight of the due day, or would it be best to be able to pick a specific time in the day? For now, if you would like students to be able to finish assignments on, say, Sunday the 27th, it would be best to set the due date to Monday the 28th. For existing assignments, you can easily edit the due date by clicking "edit assignment" (see screenshot). This works retroactively, too - when the due date is changed, it is possible that a student's assignment status goes from "late" to "completed" (on time). We will look into the unsubscribe issue, thank you for reporting! Is there any way that I can add all my assignments for the rest of the year in, and have the XP points count for the assignment that is due most recent? I tried putting in all of my assignments yesterday, but the points were being added to an assignment that was due May 20 and not the one that is due March 18. I deleted the assignments, then my students lost XP points for the March 18th assignment because it was on the May 20th assignment. I hope this makes sense. I would really like to be able to enter them all in at once and not have to worry about doing it every week. Thank you, my students really like this site and so do I.
I think it makes most sense for them to be due on midnight of the due date, especially from the perspective of the student. In the email notification the student receives it might say, for example, "It is due on Jan 6, 2016". The student would expect to be able to complete the assignment up to the due date, but instead they have to complete it on or before January 5th (in that example). Another potential solution could be to reword the email notification sent to the student to be more clear it has to be finished before the due date. Interesting. Beyond simply adding this to "duolingo schools" , this would a great feature to merge with the Duolingo coach, instead of XP you can assign number of skills or lessons and/or successful practices. It was actually how I envisioned the Coach when it was first announced, and it would make the coach much more interesting. I used the assignments feature for the first time today, but I thought the lesson I assigned would be isolated to their practice this week. I chose a lesson that many have passed before, (object pronouns) but we are covering it in class this week. I wanted them to go back and practice it. However, since they have passed it before it shows that they have already done the assignment. Is there a way to assign lessons for the specific week of study, even if they have finished the lesson in the past? Now it looks like they don't have to do it since they have it completed already. Right now it is optional to re-do it. You could ask them to earn a certain amount of points or show you a golden skill, but I understand that does not to exactly what you would like. I can see the appeal of that idea though, thanks for sharing! I'm taking note of these, thanks! Thank you for constantly improving Duolingo to meet teacher and student needs! You guys are awesome. My latest item for the Duolingo Teacher Wish List is the ability to assign not only XP and specific skills, but also a minimum number of DAYS. A sample assignment would be, practice 4 days between Monday-Sunday (of any given week). When I assign 100 XP I'd rather them earn that over 3-4 days rather than pound it out all in one day. Exactly! Could even do 10XP/day for 4 days (between now and ...). Sometimes I don't care what they do so long as they DO something. There are probably several potential ways this could be assigned, any of which I'd implement. Thanks for the ideas, emilybwilliams! I don't use assignments. Up until now I will assign lessons to my students but not use the assignment feature. Here are some reasons. I do not want them to get an email for every homework. --> this could be solved by displaying assignments in student's duolingo account. The completed/late/missed does not work for me in it's current form. I accept late work within a period of time. Open source Learning Management System (LMS) normally has two options: A due date and a cutoff date. This way, only work that has been submitted within a given time frame is still counted as late. This encourages students to quickly catch up instead of leaving it to the future. --> having this as an option would help. It is not transparent for the students. Right now, I check who did their assignments in the beginning of class by opening Duolingo on a projector. I then enter that into a Moodle (which is a LMS) database where they can see their current standing. I would need a more condensed version of the list of assignments each student has done. Ideally a list that looks exactly like the course progress site but which lists only the assignments that I gave. I want to be able to see who did the last assignment, not a list of who did how many so far. I agree with everything you said about assignments! It IS inefficient (and rather annoying, when I have to make a change) for students to get an email for each and every assignment. You're right -- SOOO many issues would be solved by displaying assignment status in the students' accounts! It seems that DL listened and made some changes with respect to due dates and time frames. Hopefully, we'll see a change with this feature in the very near future, as well! I like the way I can now view the progress of an entire class (which shows me how many assignments have been done so far). Then, when I click on a particular student, I can see an individualized progress report showing what they have completed. Overall, I think that the assignment feature is great! Just a few tweaks here and there would make it AWESOME! I have a question about how LATE ASSIGNMENTS work. I create weekly XP assignments for my students. They have from Wednesday at 9:00 am of one week until Wednesday at 8:00 am of the next week to finish it. When we get into the lab on Wednesday (around 9:00 am), there's another assignment waiting on them. My question is this... Since I have immediately given another assignment that starts on the "due date" of the previous one, it seems that DL credits any work done in the lab toward the NEW one, counting the previous one as "missed" (if it's not already completed). Will DL allow students to go back and earn XP points toward the "missed" assignment once the current one is complete and ultimately count it as "late"? I want my students to have the option of finishing assignments late for partial credit, but I'm not 100% sure how DL is counting things. Anyone know? I have a similar/same question. I did not realize that the new assignment would "take precedent" over the old assignment since the old one wasn't due yet, and so my student who finished (technically) the old assignment on time actually "missed" that one and has instead started on the new one, which I had set up prior to class (to be ready for the following week's work). So now instead of "done" or even "late" she's "missed" it (and is a bit tweaked). I know I can give her the appropriate grade, but what happens now w/DL? When she finishes the new assignment, will she then get credit on the old with any overage? I think the "start time" idea below would be very helpful in this regard. The question still remains (re: students who might wish to finish an assignment late) but it would mitigate the issue I ran into while setting up my new assignment and it overriding the one that had not yet ended. It's is great to be able to make assignments for student and I love the "end time" feature. Could you make it so teachers could have a "start time" feature too? That way I could set up assignments in advance every week. Right now if I forget to make the assignment first thing Monday morning it throws off the option for students to meet my assignment requirement. It's a little detail, but it would be very helpful to be able to make assignments in advance. I would also like to see a "start time" feature. Is Duolingo working on this? So I like the idea of assigning specific lessons a lot, but the problem is that in its current form my students have to do all of the previous lessons in order to be able to do the assignment I assigned. I have Spanish II, III, and IV students that have an extensive knowledge of Spanish and I only want to focus on the Medical vocabulary because we are doing a Health and Body unit right now. I don't need them to do all of the skills before, we've covered those in class together (or I will assign them when we get to a unit where they are relevant). Please make it possible for students to ONLY do the unit assigned by the teacher without having to do the units beforehand. E.i. when the teacher assigns it it unlocks it or something. Sadly I won't use the homework feature unless this changes. I really like the medical vocabulary and I wanted to use it in class, but for students to have to do 20 lessons just to get to the one I assigned is NOT helpful or realistic (especially when not all of my students have wi-fi or technology access at home). Also I know I could have them skip with a Placement test, but we use Duolingo as extra credit every week and students taking Placement tests ruins that. Also, what if I want them to go back and learn a previous lesson at some point because that vocabulary is relevant to what we are doing in class? I'd like to be able to use Duolingo to enhance & build on what we're doing in class (I don't center my curriculum around it), but in it's current form I don't find it possible for anything other than extra credit. I see this was posted a year ago, but I don't think it has been addressed. I would like to be able to assign certain points without them necessarily having to have completed others first. Is there any plans to make the app show students current assignments? We use ipads and personal phones in our classroom which means my kids are using the app version. It'd make my life much easier if every 5 minutes when a kid asks on their progress I could just direct them to the right part of the app. Cool. Thanks. Not all of my students have been able to see their assignments on the browser, though others have. Is it slowly disseminating for some reason? Since y'all asked for feedback and I've already expressed my wish list, I'd like to comment on how useful this feature has been. Last semester we used Duolingo as bonus points. Get so many Duolingo points by such deadline and get bonus points. Many of my students expressed the desire to just do Duolingo, but it wasn't feasible at that time. Then this semester came around and assignments were available. My students groaned when the bonus points were replaced with assignment points. At first it was a small amount. Get this chapter finished and this many points by this deadline for homework. Many of my students had already done further chapters during the previous semester while others had fallen behind due to not wanting to do extra work. This helped as a way of catching up those behind while keeping those already ahead working. After the first chapter of the semester from the old textbook, more and more students asked for pure Duolingo. I offered them a chance. Finish one chapter from the textbook, take the test, then two weeks with pure Duolingo, followed by a test I'd write. After that the decision would be put to a vote. The results came back with over 90% preferring Duolingo. They enjoy the chance to work at their own pace and even compete with each other a bit. Since then I assign a certain amount of chapter work and XP per day. I tell them to use the extra XP to go back and review old chapters. Every few weeks I offer bonus points for Gold Checks. I ask each student over to my desk and check to see if EVERY previous chapter is still gold. If it is, bonus points. We've also noticed some things. Some students work on Duolingo at home and one had the bright idea of doing Test Outs (the big ones) while using Google Translate. Little bugger. But, we noticed that when they nailed 700+ points, it would clear the assignments based on chapters/ skills, but not the assignments based on points. If I've given 7-100 point assignments, then 1-700 point test out only clears out the most recent assignment. I think that when ever you get a chunk of points, they only go into the first empty assignment they find and the rest are wasted. Here's the thing. I'm GLAD this happens. It encourages students to not try and save a ton of assignments for later only to cheat through one giant test out and skip doing regular practice work. Same kid, just the other day, tried working two tablets at once, trying to spam the Basic skill set as fast as he could over 2 devices. he only got half the credit as it seems the program only took one at a time, not two. Again, I'm GLAD as this encourages regular work instead of the lazy, fix it later attitude this kid has. Over spring break, I gave the kids 240 points (enough for 20/ day every day over spring break), but I gave it to them in 12-20 point assignments. If you have a student who's trying to cheat the system, this is a way around it. Test Out won't work and they'll still have to go through the review lessons properly. So, all in all this has been a great addition to Duolingo and I look forward to the ones we know are coming (students can see their own assignments instead of asking me). Great work all the wonderful people who volunteer on this site! Is there a timeline to have assignments and/or assignment notifications for students using a smartphone app? I would LOVE this feature as well!!!! Is there a way to connect assignments to the app? Thanks working to design such a great program! I really love the new features! ¡Muchas gracias! Great feature! I think this will be very popular among teachers, and make it easier for them to work with Duolingo in their classes. It will also be easier to engage students. Well done! This isn't working today. :( Any reason why? Hi there, can you go into a bit more detail as to what isn't working? Thank you! I LOVE these new features. I, personally, would NOT want to see points rolled over. The weekly XP assignments I give are designed to keep students PRACTICING in order to move words and concepts into their long term memories. As I understand it, this is premise that the DL algorithm is working under, as well. If they can "roll over" points, it would defeat the purpose of staggered, repetitive practice for that particular week. I've devised a pen-and-paper way (which requires the STUDENT to track the overages) to award extra credit for those who "go over" assigned points. It has been EXTREMELY successful! Most of my students have practiced outside of class MUCH more than they had previously been doing. I even had one who earned 1000XP points in a week! (That's not a typo -- she earned one-thousand XP in a single week!). The way I look at it, the more they practice, the more they learn, and they more they learn, the easier MY job of teaching them additional things will be! I agree. Weekly points are the best way to get the kids to practice outside of class. It makes my job easier because they really know the vocabulary. Yep. Right there with you. Hi there, so glad to hear you are enjoying the assignments feature! Currently, points cannot be rolled over. Is this something you would want to see? I'd like the option, if it's possible. (Though some teachers wouldn't want it) You see, before the assignment feature, my students had to do 40x a week, but then if they wanted to go above/beyond and did 80x in one week, then they could roll them over to the next week. (all calculated by me by hand). However, with the new feature, if I assign 50x each week and a student does more (say 80x), then it seems like the 30x won't be counted anywhere, nor will I be alerted (as the teacher) that they've done more. Am I right in saying this? I believe that the intent of Duolingo is constant practice, which moves language from short term memory to long term memory. For my students, I would prefer that the points not be rolled over. I plan to assign 50XP per week for each student. This, I think, will allow the students who are ahead, to continue going and those who are behind, the ability to continue where they are also. I think I will love this assignment feature. Thank you. I agree agree with Mrs.FosterBMS above, in that if it's one or other, I'd prefer NOT to have rollover points. However, if it would be a feature that can be turned on/off then I'd like the option on the off-chance it would be useful for bonus points to purchase things from my classroom "store." I was a little confused about the assignments option. I thought that I could assign a topic and then the students would be able to access that topic regardless of where they are in the program. Instead, they would have to complete all previous topics to get to that point. I would love for my upper level students to practice some of the higher level grammar topics, but I guess that's not possible at this point. Any chance it will be an option? Hi! Do you mean you would like your higher level students to "unlock" the units further down in the tree? Do you know if they took a placement test? That should have placed them in a suitable place in their course. Or did you mean you would like to assign different units to different groups? Most of my students just started using Duolingo this year. They did take the placement test, but haven't progressed to the advanced levels yet. I may at least use the sample lessons in class with them. Another teacher asked: "I am wondering if student progress is saved based on their profile. For example, If I create a class, and they work to a certain point, then I have them join a different class in the future, can I see their progress from before, and does it let them pick up from where they left off? I would think so, just want to be sure as I set up requirements for my students." Re. the new assignments feature - I have a new class of Spanish 2, most of whom have never used Duolingo. Can I assign them skills in the middle of the tree, or will they have to start from the beginning? Hi! The assignment is for students to reach a skill, meaning they would need to do all skills up to that point. When they create their accounts, ask them to take the placement test. That should help them advance and skip what they already know. :] If they forgot to do the placement test and already started, I'd recommend erasing the tree and taking the placement test. Here are instructions of how to delete a course (to start over). If they don't want to delete their progress, students can also "Test Out" of skills by clicking the yellow checkpoints either in the tree or in the skill itself. Please check out these instructions: How can I skip the basics? I hope this helps! I love this new feature but before assigning XP I want to know exactly how they are awarded. Where can I find this? Also is there a way for students to see how many skills they have completed? Hi! 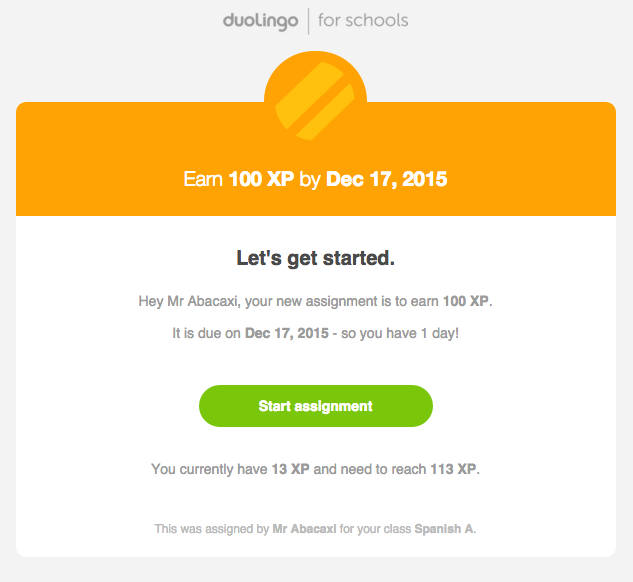 The XP is awarded as one normally earns points on Duolingo, by practicing and refreshing lessons. If Immersion is available to your students, the XP earned in there will not count towards the assignment. The points start counting from when the assignment is created. Students will not know where they are (we are planning on creating ways to make it clearer to students), but a teacher can check in Duolingo for Schools. Students can check their points in the leaderboard on their main Duolingo page to have an idea of how many points they have earned that week (they need to "follow" at least one other person to see the leaderboard). They need to earn all the points that are due in the language that was assigned. Right now, students get an assignment email that tells them how many points they have and still need. I hope this helps! We are going to add this to the Schools help page. I have tried it this week with all 6 of my classes and the students really like earning XP rather than having to complete a "skill". They can see their XP (We figured this out today) by looking at their daily graph. It has a line graph that shows how many XP they have earned each day during the week. They add up their points daily and know their total for the week. I have assigned my middle school French students 50 XP from Monday - Friday (I have Saturday listed in Duolingo because of how Duolingo thinks of assignments.) The students have to complete 1 lesson for 10 XP, so for my students they must complete 5 lessons for 50 XP. Teachers: I have a smart board and I projected their progress so the entire class could see how far each student had gotten as of today. Some students were already finished and some had not started! The students who had not started got a friendly reminder to get to work! ha ha. Anyway, there are no surprises because the teacher page is fantastic. It even tells you how many of your students are finished, or late or didn't do it. "Teachers: I have a smart board and I projected their progress so the entire class could see how far each student had gotten as of today. " Cool idea, I wanted to highlight it. :] We're glad it's working well for you, and we are still polishing up assignments, so stay tuned for even more details and tweaks in the coming weeks and months. Thanks for your feedback! One more request for my wish list... is there a way I can see which assignments my students have completed (or missed) for a given time frame? For example, I see that as I continue to assign homework throughout the semester those numbers on completed, late and missed assignments are going to get pretty confusing to track which assignments are which. I get a weekly email to my school email inbox with a report for each class period. I love this feature! I actually get 6 emails because I teach 6 classes. In each email, it lists the student's name, how many XP they earned that week and which lessons they worked on. **When I started in January assigning 50 XP per week, some of my students went back to the first lesson on Basics 1 and repeated it 5 times to get 50 XP!! I was surprised that they would resort to this; but middle school students are known for this type of behavior, so for week 2 the assignment was specific. I assigned them 50 XP but they had to do lessons that they had not done yet. I can track this with the course progress button and in the email that I get. I used to get those emails, but I haven't received the weekly progress emails since Duolingo switched to the new system. I guess I need to look at my settings or something to get them to send me class reports again. I just figured they stopped sending them to all teachers, but it sounds like it's a glitch. Thanks! Das ist wirklich wichtig! Viel Danke! Like another teacher who left a previous comment, I do NOT get the weekly email updates. I signed up my classes just this year, but I have NEVER received any kind of update about their progress. You replied to the teacher who previously posted about this issue that her email had been blocked and you "reset" it. Could this be the problem with my account as well?? Sorry to comment here this, but Duolingo seems not have a space to do this. If I am wrong tell me please. The comments are been one of the best things on Duolingo, but when we are searching for a question we are having difficult we are obligate to see all the sub comments. It would be better if at first we see only the firsts comments and in case we want to see the responses we can select the Comment to see all the sub comment. So we can go directly to the point and if we want to see a sub comment is just we select the main comment. There is a bug in the assignments to earn XP. My student showed me that he made more than 200XP when he was required to do only 20 and the assignment is not cleared yet. Could you please let us know when you fix it? Kind regards. I just thought I would add my thoughts to the mix. I really enjoy using Duolingo and my students do too. The important features for me are the Activity Details, the Course Progress, and the Spreadsheet. I use the student’s level for extra points added to their Homework/Class Participation Grade each month. I have a point system of extra credit points that correspond to each level in Duolingo; the points increase with each level. As we all know, a huge benefit to using Duolingo for Schools is our ability to track our students’ use in and outside the classroom. Many of my students have downloaded the app to their iPhone and are using Duolingo whenever and wherever they can. I really enjoy receiving the Duolingo Weekly Report for each class so that I can see who is practicing and what lessons they are doing. Students also look forward to doing Duolingo in class as a reward for finishing all of their work early. At least once a month I have a Duolingo Class Participation Day where the students have to earn a preset number of XPs in order to break even for the day. Under that number and the students lose up to 5 points off of their Homework/Class Participation Grade. Over that number they can earn up to 5 extra points. I begin the Duolingo Class Participation Day by projecting their Duolingo Class on the screen so that they can see where they stand with XPs and which activities they have completed compared with others. I download the Spreadsheet for each class just before the Duolingo Class Participation Day and then just after in order to figure out how many XPs they earned. I can double-check this figure on their class page by clicking on the date range. (If you want only one date just click on it twice.) At the end of each month I download the Spreadsheet to figure out their levels, figure out the extra credit points, subtract the points previously used and add the remaining to their Homework/Class Participation Grade for the month. Duolingo, this is really working for me and my students! Thank you! I'm not sure if this is an option yet as I have seen much rhetoric and not sure if my request has become an option. There really needs to be a recurring assignment feature and an assignment start time feature!!! I forgot to post an assignment until later in the day. On the student side it shows up as if they are behind on their goal. Any way to fix this?? I analyse my students' errors in every written test and assign individual areas of development to each of them. It would be great if they could use Duolingo as a practice tool. To make it work, I would need to assign different skills to different students in my class. Can you make that work? Am I correct in that the only way for the students to complete an assignment is to open the assignment via their email? I just assigned an assignment and I can see that many students did at least 100 XP's of duolingo this last week, however, it says 0 completed assignments. If the assignment is just to complete a certain amount of XP's, why do they have to log into their email first? Can't duolingo just keep track of the XP's they do and count that towards their assignment? My students can find their assignments on the right side of their homepage when logged in to duolingo on a computer. They cannot access the assignments through the app, but have had no problem doing it through the computer. How can I copy assignments to other classes? You can't...:( It's been one of the things we've been asking for for quite a while. Please add the ability to unlock a specific assignment so that students can be given exercises relevant to what we are studying in class. It's really frustrating not to be able to do this now! Thank you. Not sure if I am in the right place for this question, but I assigned an XP goal to my students. While a number of students have completed it, only two students are actually showing as having completed it, and I don't know why? The others completed the XP points after it was assigned, as well. I can't figure out what the difference is. Is there a way to create assignments in future months? I can only get the calendar to show the current month. Thanks! New: Control Your Students' Privacy Settings! [Duolingo for Schools Contest] Win iPads for your class!